Washongton Water Damage offers emergency water & flood damage service 24 hours a day, 365 days a year. Serving Seattle, Tacoma, Everett and Bellevue Areas. Our response is quick and immediate. We are your Water Damage Experts! Washington Water Damage and Cleaning Services are trained and certified in both residential and commercial fire clean up with quick Seattle fire damage response to Tacoma and Everett. The Washington Water Damage team offers Emergency Water, Flood, Sewage clean up, Fire and Smoke Damage Restoration services 24 hours a day, 365 days a year. We can immediately respond to fire and water damage in Seattle, from Bellevue to Tacoma, Everett, and Bothell. Our mission is to protect the investments and the health of our clients with effective and successful solutions while having the fastest response of any company. Our clients tell us the one thing that exceeds their expectation is our dedication to fine details on the job. You will be happy with our process working directly with your insurance company. We have developed great rapport with the local insurance industry representatives! Expect fast water extraction and sewage removal services to many of our suburbs and communities around Covington, Renton and Kent, and the Eastside’s Kirkland and Redmond areas along Snoqualmie Ridge, North Bend, Issaquah and Sammamish. We have a very fast & short response time! Our immediate response teams of certified and experienced technicians use the newest up-to-date equipment for water extraction, removal and broken pipes. Fast response times for Broken Pipes. Call as soon as possible to shut off water. Sewage Cleanup Removal and Extraction – Sewer water and clean up – additional sewage removal information. Convenient central hub in Kent means fast service for clean up to all communities including Seattle, Covington, Tacoma and Puyallup and the Greater Eastside. Please fill out the information below or call our office toll free at 866.618.7774. When it comes to water damage repair and mold remediation, you don’t want just anyone treating the problem. You need a certified and experienced team you can count on for immediate results to save your home or business from extreme damage. Specialist and a recommended solution in Seattle Tacoma area for both severe and minor fire and smoke damage and restoration. Our Sewage Cleanup Specialists will cover your entire house or business performing sewage cleanup and containment, and ensuring your property is properly disinfected and cleansed! Fast water extraction, removal and broken pipes service. Our water and flood damage service is 24/7 to Issaquah/Sammamish, Redmond, Kent, Renton, and Lynnwood. Specialized service in Sewage clean up. Full sanitation for your peace of mind! Why Washington Water Damage and Cleaning Services? Dispatch certified technicians who are available 24 hours 7 days a week ready to handle ANY emergency service. Fast service to all communities with multiple service personnel throughout the region from Woodinville, Redmond, Maple Valley, Covington, Federal Way, Everett and all of Tacoma & Greater Seattle! Service the entire Puget Sound area with our state-of-the-art equipment. By working directly with your insurance company for your convenience. Thank you very much for your services on our floor issue. I speak for both myself and Dale when I say we were very pleased with your company’s service. It was great that you were accessible when we needed you. I also want to commend you on your patience. You handled the challenges of insurance timelines beautifully. The work you did was great. As you know I am in the construction business and know a bit about how things should go. I never felt anything less than professionalism and high-quality work. I would highly recommend you and your company to anyone. I can’t thank you enough for your help. Your staff was very professional and helpful. Thank you for your help during that trying time. I want to thank you for making what was a disastrous situation as pleasurable as possible. Through the insurance difficulties you were absolutely professional, sincere and more than helpful. For that I am grateful. Thank you and your team for everything, you definitely lived up to all the wonderful things customers wrote about you online! 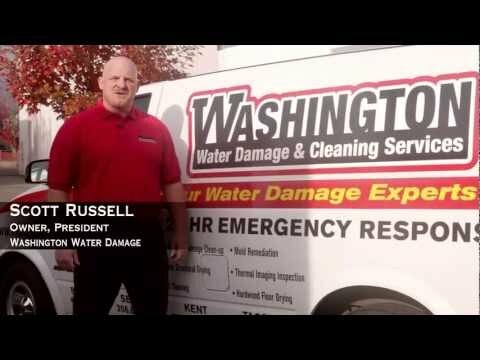 Washington Water Damage are the ones to call if you have a disaster. We had a pipe break while we were on vacation. Our house was ruined! The crew did a great job drying our house, caring for our furniture and putting everything back in place. The construction crew did a great job repairing the house and it looks great. This disaster has allowed us to remodel and thanks to WWD they turned a tough situation into a blessing. To the Washington Water and the people who put my upstairs back in shape? NICE JOB! I appreciate the effort that went into all of your work.